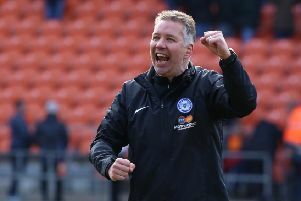 Peterborough United star striker Conor Washington believes that a change in his mentality has been the key to unlocking his goalscoring potential. The 23-year-old increased his goal tally to 11 goals for the season with his clinical finish in Posh’s 1-1 draw with Shrewsbury on Saturday (December 12). And it has been an impressive turnaround of form from the former Newport County man who netted just 12 times in League One for the Posh last season. Washington said: “My biggest improvement is mentally. I am now going into games with an added edge of aggression. I have the confidence to turn and run at defenders which is something I haven’t managed to do successfully since I was at Newport. “To improve your mental state is a hard thing to do but recently I have managed to get myself in a good frame of mind before each game. I now go into games thinking that no matter who I face on the pitch I will beat them and score at least one goal. Peterborough’s winning run was halted with a draw against the Shrews on Saturday and the former St Ives forward admitted that the stalemate felt like a defeat. He said: “We have to take the positives and negatives out of Saturday’s game and weigh them up. It did feel like a defeat with the good run we have been on and it was even more disappointing to not put in a good performance. “I have made a good habit of taking the ball out of the air and finishing it at the moment which is great because it is something that I have worked on improving in training. Washington’s current run has been the best form of his professional career and he now boasts nine goals in nine games, but the Chatham-born striker is determined to improve on his nearly 30 goals in 90 games ratio during his time at the ABAX. He added: “It is pleasing that I am approaching a one-goal-in-three-games ratio thanks to my current run but I want to continue this form and hopefully by the end of the season I will be closer to reaching a one-goal-in-two-game ratio.